Second-ranked Ohio State kept their national championship hopes alive by converting a fourth-down play and beating their rival, No. 3 Michigan, in double-overtime. After both teams scored touchdowns in the first overtime, including a five-yard touchdown pass by Michigan on their own fourth down, the Wolverines started the second overtime with a field goal to take a 27-24 lead. Ohio State then needed a field goal to force a third overtime. On third down from the 24-yard line, a wild scramble by Curtis Samuel turned a sure loss into an eight-yard gain. The Buckeyes faced a fourth-and-one from the 16-yard line. But with Ohio State kicker Tyler Durbin missing two short field goals earlier in the game — but also hitting a field goal to force overtime at the end of regulation — Urban Meyer decided to go for it on fourth down. Ohio State quarterback J.T. Barrett kept the ball out of the shotgun and tried to run for the first down. Needing to reach the 15-yard line, Barrett was stopped right at the marker when he ran into the back of a teammate. Officials initially ruled he had made a first down. ABC cameras did not have a good view of the run that showed definitively whether or not Barrett reached the first-down marker. However, it does look like his forward progress reached the 15 and at the very least there was not enough to overturn the call. Officials reviewed the play and determined there was not enough evidence to overturn, ruling that the call on the field — a first down — would stand. 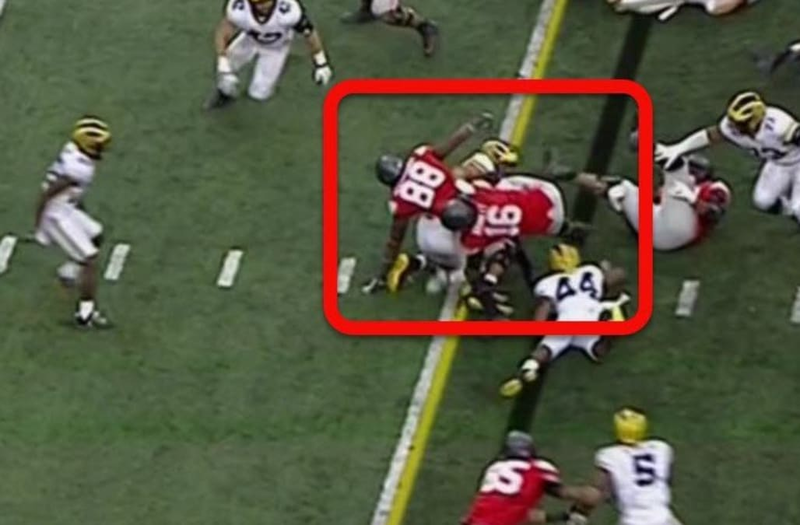 On the very next play, Samuel ran the ball in from 15 yards out and Ohio State won the game. With the win, Ohio State keeps their College Football Playoff hopes alive. The loss by Michigan knocks them out of the Big Ten championship game and likely out of the playoff picture. Ohio State will go to the Big Ten title game if Penn State loses to Michigan State later in the day.